This simulated 10×50 binocular view shows first-magnitude star Aldebaran in the constellation of Taurus about to be occulted by the waxing gibbous Moon close to 5:24am GMT on 13 December as seen from the centre of the British Isles. Several stars in the Hyades open cluster are hidden by the Moon on the UK night of 12-13 December as described in the text. Weather permitting, Aldebaran’s occultation is observable from south and east Canada, the entirety of the contiguous United States (except southern Florida), northern Mexico, the southern tip of Greenland, westernmost Europe (except northeastern Scotland) and northwestern Africa. AN graphic by Ade Ashford. When the Moon passes in front of a bright open star cluster, you can observe a series of stellar occultations in quick succession. 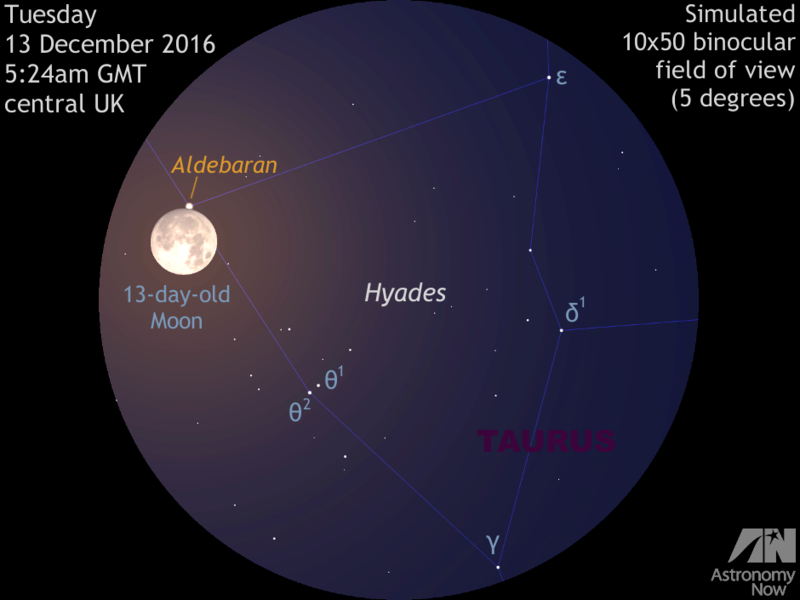 Such is the case on the night of 12-13 December when the waxing gibbous Moon glides in front of the Hyades in Taurus, culminating in the occultation of first-magnitude star Aldebaran about 1½ hours before moonset for observers in the British Isles. As the Moon passes in front the v-shaped Hyades — the nearest open cluster to the solar system — the first conspicuous star to be occulted is magnitude +3.7 star gamma (γ) Tauri on the UK evening of 12 December. For observers in Edinburgh, the star disappears behind the dark lunar limb at 9:38pm GMT. For Londoners, the star’s disappearance occurs 1½ minutes later. 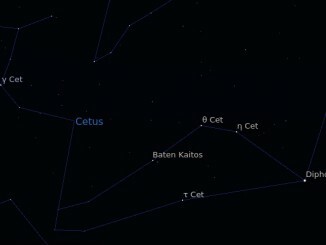 Magnitude +3.8 theta1 (θ1) Tauri forms a naked-eye double star with magnitude +3.4 θ2 Tauri. As viewed from the centre of the British Isles, θ1 is hidden by the Moon at 2:01am GMT on 13 December, while θ2 disappears some ten minutes later. 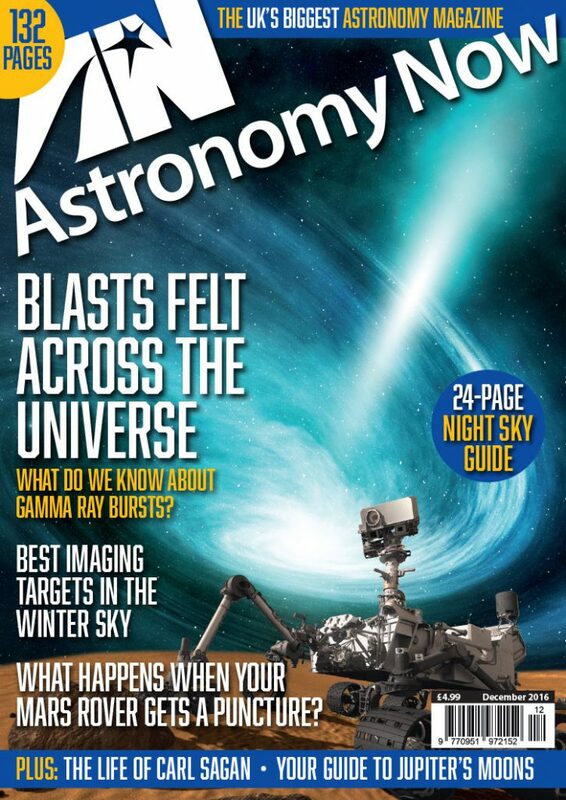 The stars reappear in the reverse order for the heart of the UK: θ2 close to 2:51am and θ1 just before 2:59am GMT. For those with the stamina to stay up until beyond 5am GMT (or simply wish to set their alarm for the highlight), the Moon occults magnitude +0.9 star Aldebaran shortly before 5:24am GMT on Tuesday 13 December as seen from the centre of the British Isles. 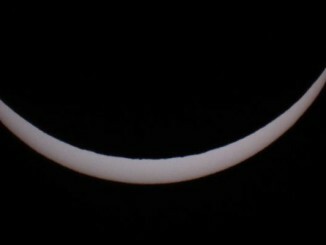 Viewed from London, the star disappears behind the advancing dark lunar limb at 5:23:45am GMT, or two minutes later if observed from Edinburgh. As seen from the heart of the UK, Aldebaran disappears close to 5:24am and reappears shortly before 5:48am GMT. If you are keen to view Aldebaran’s return at the bright lunar limb it’s essential to choose a location with an unobstructed view of the west-northwest as the setting Moon will be just 9 degrees (almost the span of a fist held at arm’s length) above the horizon. This occultation of Aldebaran is the last of a series of twelve during 2016. Weather permitting, the event is observable from south and east Canada, the entirety of the contiguous United States (except southern Florida), northern Mexico, the southern tip of Greenland, westernmost Europe (except northeastern Scotland) and northwestern Africa. As seen from the USA, Aldebaran’s occultation occurs mostly on the evening of 12 December. In Los Angeles, CA, the star’s disappearance happens shortly before 7:02pm local time in the eastern sky, reappearing shortly after 8:08pm. For Dallas, TX, Aldebaran winks out close to 9:26pm, returning shortly before 10:37pm local time. In Chicago, IL, Aldebaran’s disappearance is seen near 9:48pm local time, reappearance occuring shortly after 11:04pm. For New York, NY, expect to see the star hidden close to 11:13pm on 12 December and reemerge shortly before 12:28am local time on 13 December. Although the weather forecast is not too good, observers in Scotland and northern England could see asteroid (12655) 5041 T-3 occult a 5.7-magnitude star in western Cetus close to 7:48pm tonight. 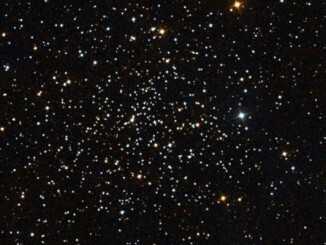 University of Texas astronomer Natalie Gosnell has used the Hubble Space Telescope to better understand why some stars aren’t evolving as predicted. These so-called “blue stragglers” look hotter and bluer than they should for their advanced age. It’s almost as it they were somehow reinvigorated to look much younger than they really are.